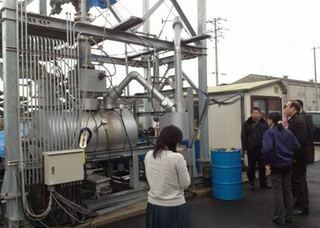 四川省環境庁来日＆装置見学: リサイクルエナジーブログ　RECYCLE ENERGY CO.,LTD. The hospitable host “Sichuan Environment Ministry” during the time when we visited Sichuan was coming all the way to our office in Japan this time. Despite of the limited time, they saw the actual operation of our pilot plant (processing ability 5kg/h), exchanged opinions with us after the presentation, and paid a visit on another bigger plant (processing ability 50kg/h). They will come visit Hiroshima again next year and we will make every effort to show them how well we are running the oil-converting business at that time.